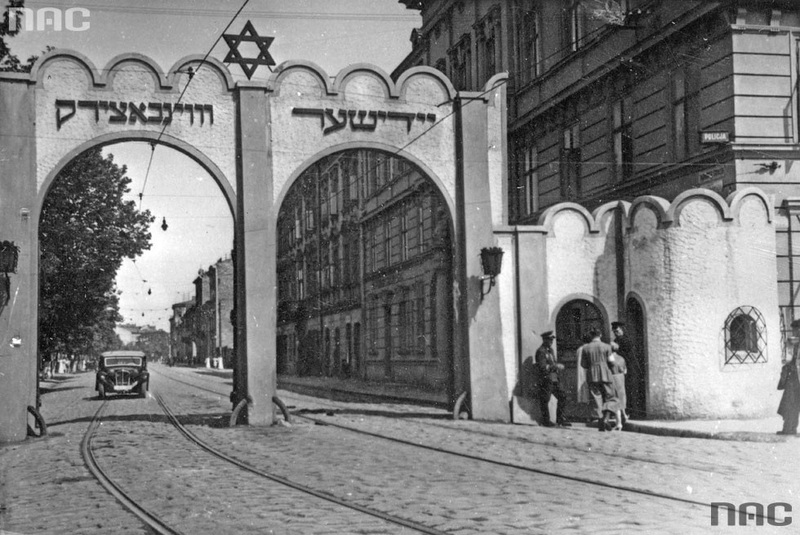 Krakow Ghetto was established in 1941 in Podgorze district. It was one of five major, metropolitan Jewish ghettos created by Nazi Germany in the territories of occupied Poland (General Government – Generalne Gubernatorstwo). Before 1939, Krakow was inhabited by around 70.000 Jews, with the vast majority living in the district of Kazimierz. On 6 September 1939, Nazis entered Krakow and began the occupation. Persecution of the Jews began almost immediately. Jews were required to participate in the forced work, wear dedicated armbands, all of Krakow Synagogues were closed. Nazis were confiscating Jewish property and belongings. On the orders of the Nazi authorities, Krakow was to be cleared of Jewish people by May 1940. Massive deportations of Jews from the city were ordered. Many Jews were deported mainly to neighbouring towns and villages, but also to distant parts of Poland. Some Jewish families managed to emigrate. Around 15.000 Jews were permitted to remain in Krakow, mostly workers employed on services considered important by the Germans. However, further persecution of the Jewish people took place and the decision to create a ghetto was made. 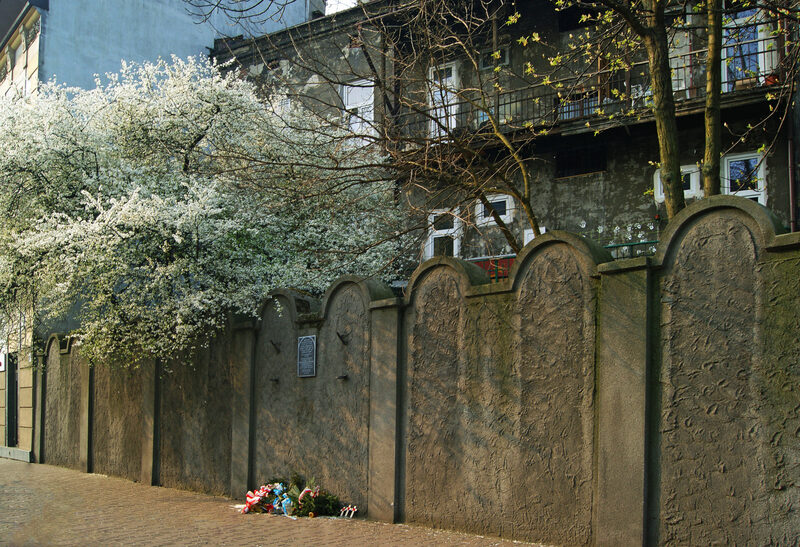 The Krakow ghetto was formally established on 3 March 1941. It was located in the Podgorze district, an area of the city of Krakow on the southern side of the Vistula River. It consisted of 30 streets and 320 one- and two-storey buildings and before 1941, was occupied by little over 3.000 people. All Jews remaining in Krakow were forced to relocate from Kazimierz. Poles living in Podgorze were also ordered to leave their homes. As a result, the district was suddenly occupied by five times more people. One apartment was allocated by up to four families, and many less fortunate lived on the street. The Ghetto was surrounded by the newly built walls that kept it separated from the rest of the city. They were built in close resemblance to Jewish tombstones, matzevahs. All windows in the buildings that opened onto the “Aryan” side were bricked up. Because a number of companies were located on the “Aryan” side of Podgorze, two tram lines were left in the Ghetto but ran through it without stopping. To the Ghetto led four gates, each heavily guarded by German military police and members of the Polish police (the so-called Blue Police, auxiliary police organisation under German leadership, formed by Nazi Germany by reinstating Polish state police that existed before the war). All Jewish organisations in the Ghetto were operating on the orders and under control of Gestapo. However, resistance groups existed, such as Jewish Combat Organisation that was supported by the Polish Home Army and the Polish Underground State. Starting at the end of May 1942, Nazis began systematic deportations from the Ghetto to surrounding concentration camps, such as Krakow-Plaszow or Auschwitz Birkenau. The main site of assembling Jews before deportations was on Zgody Square and then they were escorted to the railway station. 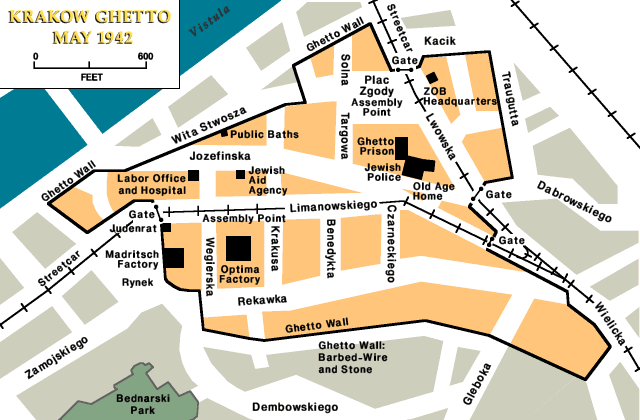 On 13-14 March 1943, the liquidation of the ghetto was carried out. Jews that were considered fit for work, approximately 8.000, were transported to Krakow-Plaszow. Around 2.000 were killed in the streets during the liquidation of the ghetto, the remaining inhabitants were deported to Auschwitz-Birkenau and there also murdered. Of the Jewish community of nearly 70.000 in Krakow, only about a thousand people survived the war. Today, the starting point of deportations to death camps, Zgody Square is known as the Ghetto Heroes Square (in Polish Plac Bohaterow Getta) and is a place of art installation, commemorating victims of the Holocaust. 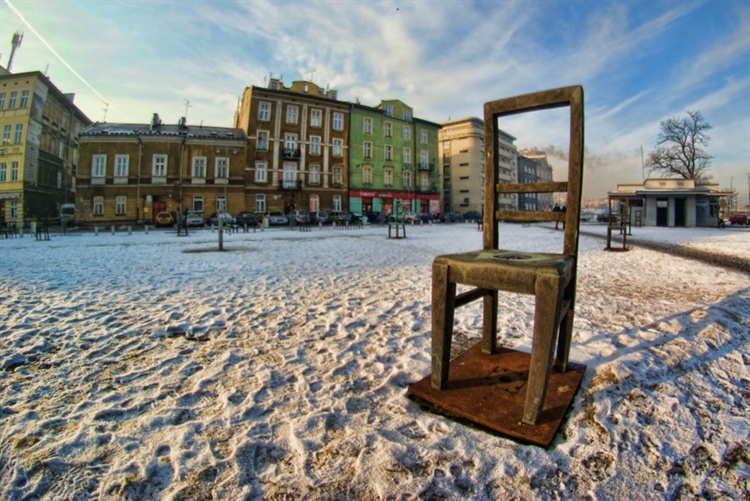 Inspired by descriptions of lots of abandoned furniture and personal belongings strewn around the square after the liquidation of the Ghetto, the installation comprises dozens of large iron chairs. The only remaining piece of the once Ghetto walls at Lwowska Streer is adorned with a plaque which reads “Here they lived, suffered and perished at the hands of Hitler’s executioners. From here they began their final journey to the death camps“. The only Polish person living in the Krakow Ghetto was Tadeusz Pankiewicz, owner of ‘The Eagle Pharmacy’. The pharmacy was located at the Zgody Square 18 and it was almost unprecedented that the Nazi authorities allowed this business to run when Ghetto was established. It was possible due to large bribes that Pankiewicz was offering. He employed three women, Irena Drozdzikowska, Helena Krywaniuk and Aurelia Danek, to help him run the only pharmacy in the Ghetto. The pharmacy not only supplied the Jews with medicines, often free of charge. It quickly became a meeting place of the Jewish intelligentsia living in the Ghetto and of contraband. Tadeusz Pankiewicz was named “Righteous Among the Nations” by Israel in 1983. Today, in the ‘The Eagle Pharmacy’ houses a branch of the Historical Museum of Krakow . It was established in 2004 after a thorough restoration of the pharmacy. It was possible largely thanks to the contribution of Roman Polanski (who escaped the Krakow Ghetto as a child) and Steven Spielberg. The museum now shows how ‘The Eagle Pharmacy’ looked during World War II and explains the history of Holocaust.